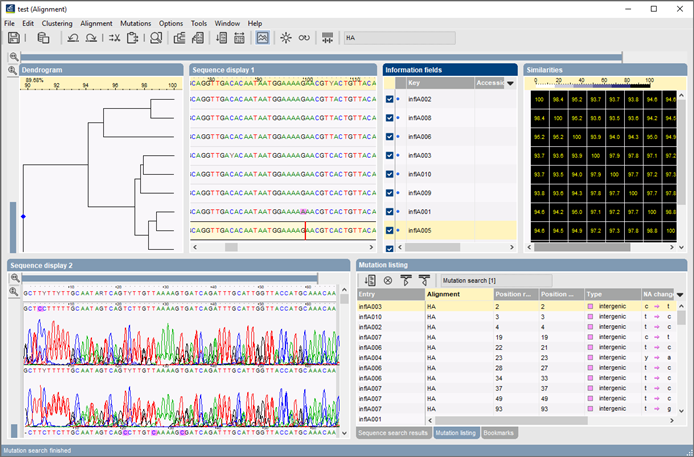 The versatile user interface allows sequences in multiple alignments to be displayed as raw chromatogram files as well as translated protein sequences. Direct editing is possible in any visualization. Multiple alignments associated with dendrograms can be edited manually in drag-and-drop mode, and a multistep undo/redo function makes editing even more convenient. In addition to well-established alignment algorithms such as the Wilbur Lipman and Needleman Wunsch algorithm, the software contains extremely fast and reliable algorithms elaborated at Applied Maths.